While I can't deny the violin-shaped shell is unusual and pretty, this is horrible. What is it with us? I guess littering is like a "little death" so people don't think all that much about it in the same way they might think about stabbing their Aunt Susan*. This is the kind of thing that makes me fearful of humanity spreading out into space right now. What are we going to do to the universe? We already have space junk out there. What will happen when we can just jettison the contents of our trash compactor out of an airlock or leave Slurm containers among the remains of our campsite on Mars? I've been having lot of big thinks lately about humanity (happens when I'm writing a lot) and I am always eventually tormented by the thought that we are already able to do damage that we're unable to easily repair and don't even think to repair until the proof is in our faces (if we believe the truth). I don't believe the big problems in humanity are in our -isms and schisms and that, I believe they are rooted much more deeply: in a lack of self-awareness and awareness about our species and the real ripple effects a very small action, good or bad, can make even after we're removed from the situation. Most people think of humans as different than animals to a degree that they can study a species and maybe even compare it to humans, but never look at the human species in a removed or detached enough light to really get to know us in a way that isn't personal, so to speak. I know that people out there do this for a living, and some of you may be those people, but on a large scale, I think people don't ask themselves questions like "Why is it alright for me to be careless, even this one time, even though *probably* nothing bad will happen?" The person who left that six-pack holder surely didn't ask themselves that. They didn't even bother to rip the plastic so the holes would be open. 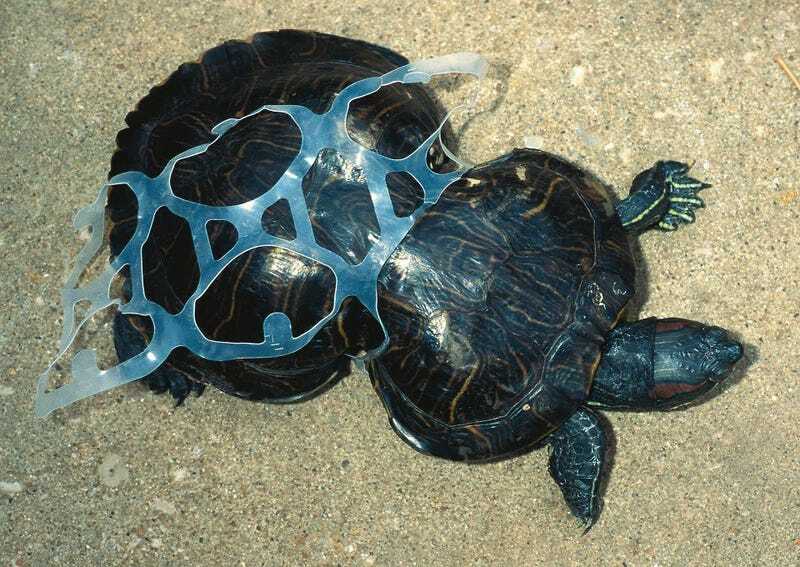 I throw six-pack holders away but I still cut them so that there is no hole for any creature to be caught in should the bag somehow be ripped or something. This bothers me, because the advancements we're making in science and technology are far outpacing humanity's ability to give a damn about the effects of the human species on literally anything else, including other humans. *I don't think you are all thinking about stabbing your Aunt Susan. But if you are? I'll know.